British Charolais records were smashed in Stirling on Wednesday 19 October, when Barnsford Ferny was bid to 70,000gns, believed to be a new world breed auction record, together with a new centre Continental breed average of £6,279 for 97 bulls sold at the society’s official autumn show and sale. The sale topper also achieved a new record for a beef animal to come under the hammer sold in Scotland. “Today’s high point was yet another milestone in British Charolais history having eclipsed the previous 56,000gns set in 1989 for Maerdy Director, while for most of the day trade clearly reflected the current commercial marketplace where Charolais sired calves have been attracting record prices from finishers confident of their superior weight for age and overall efficiency,” commented the society’s David Benson. Barnsford Ferny TI +39, SRI +44 was a first prize 17 month old, bred and exhibited by Tom and Sheena Gatherer, Inchinnan, Glasgow, he was by the 30,000gns Balmyle Bollinger and out of the 10,000gns Elrick Uranium sired Alwent Broom. Within 70 seconds of arriving in the ring, he had reached 70,000gns in a final two way match between the under bidders, a consortium of Harestone and Newhouse herds and the purchaser, Charlie Boden who had previously invested 55,000gns in Thrunton Voldemort. The Gatherers were enjoying what could only be described as a fairy tale in the pedigree beef sector. Both coming from farming backgrounds and currently working for the SSPCA, they established a pedigree Charolais herd on their 65 acre smallholding back in 2007 with their foundation cow, Alwent Broom who was purchased outside the ring in Carlisle as an early 50th birthday present for Tom. Since then the herd has grown to three cows selected for scale and accompanying performance data and plans are to expand to five cows. While Barney had found success at a couple of local shows this season, he was the Gatherer’s first ever beast to be sold in the ring. Next at 16,000gns was Thrunton Fearless TI +44, SRI +47, an 18 month old from the Campbell family, Colin, sons Ian and John, grandsons Bruce, Andrew and Edward, of Thrunton, Alnwick in a joint bid to near neighbours, Michael Massie, Auchnagatt, Ellon and Neil Barclay, Crathes, Banchory who between the run almost 200 pedigree cows. “He was the pick of the sale for both parties,” said Neil Barclay. “He was very correct, with great length, conformation and style and he came from two good families.” Fearless was bred from prestigious bloodlines. He was by Burradon Talisman who had already sired three of their Perth champions, out of the Mowbraypark Orlando sired Thrunton Tranqulity who had also bred another three Perth supremos, and he was a full brother to the 20,000gns Perth champion, Thrunton Crownprince. The Campbells went on to sell five more entries to average over £8,000 including Thrunton Festival TI +42, SRI +29 at 8,000gns, an 18 month old by the 22,000gns Newhouse Bigal and out of a Burradon Talisman sired homebred dam to Messrs Anderson and Son, Lauder. Another same age Bigal son, Thrunton Flashman TI +57, SRI +50 made 7,000gns to Messrs Williams Partners, Blackmill, Bridgend. Two entries were next in the price stakes at 14,000gns each. First to go was the reserve intermediate champion, Brampton Fugitive TI+19, SRI +21, an 18 month old from father and daughter team, Billy and Sarah Turner, Skelton on Ure, Ripon. Sired by the 8,000gns Trefonnen Crouch, he was out of a homebred dam going back to the 40 year old herd’s foundation lines. Fugitive who was no stranger to the ring having secured the Great Yorkshire breed title, sold to Alistair Brooke, Glenluce, Newton Stewart who admired him for his ‘height, length and leanness’, to run between his 12 cow pedigree herd and 100 suckler cows. Later on, Hamish Goldie, Ruthwell, Dumfries sold Goldies Fantastic TI +68, SRI +65, a 16 month old within the breed’s top 1%, for the day’s second 14,000gns bid to Messrs Jones and Son, Dryslwyn, Carmarthen. Sired by Goldies Ambassador and out of a homebred dam by the 16,000gns Perth champion, Maerdy Naser, Fantastic was full brother to the 15,000gns Goldies Dynamite. Hamish Goldie also offered at 7,500gns Goldies Flyer TI +68, SRI +59, another top 1% bull, this time a 17 month old by the 34,000gns Goldies Uppermost and out of a homebred dam by Killadeas Legend. The buyers were Messrs Fisher, Portpatrick, Stranraer. At 11,000gns John Green, Lillesleaf, Melrose sold his highest lot ever since establishing his 45 cow herd 10 years ago. The 18 month old Greenall Franklinroosevelt TI +53, SRI +46, was by the 28,000gns Perth supremo, Brampton Nacodar and out of a homebred dam by Doonally New. He went home with commercial producer, Jimmy Warnock, Dreva, Broughton, Biggar. Father and son team, John and Peter Howells made another successful 800 mile round trip to Stirling from Llanwenog, Llanybydder with Gwenog Fieldmarshall TI +37, SRI +39 selling at 11,000gns. A 15 month old by the 16,000gns Blelack Tycoon and out a homebred dam by the 17,000gns Derryharney Outstanding, he returned to Wales with Bob Roberts, Abergele, Conway. Two, 18 month old entries from another father and son team, Neil and Graeme Massie, Aboyne found themselves vying for the senior championship title and the following day were among the money. Edging ahead was Blelack Figaro TI +49, SRI +46, one of the first sons in the ring by the 14,000gns Maerdy Dublin and out of a homebred cow by Thrunton Damien. He went on to sell for 8,500gns to John Gordon, Huntley. Standing below Figaro in the senior line up was Blelack Fabulous TI +57, SRI +57, a Swalesmoor Bayonet son and out of a home bred dam from their 120 cow herd by the 15,000gns Maerdy Oxo. Fabulous was knocked down sold for 10,000gns to Flintshire vet, Esmor Evans, Mold. The Massies sold each of their nine entries including at 7,000gns to Messrs Millar, Tealing, Dundee. This one was Blelack Frolic TI +38, SRI +33, another 18 month old Maerdy Dublin son and out of a homebred dam by the 12,000gns Perth champion, Cargriff Victorious. Neil Barclay and his son, Stuart recouped their spend earlier in the day when they sold at 10,000gns Harestone Funky TI +45, SRI +40, a 16 month old by the 25,000gns Goldies Unbeatable and out of a French bred cow. 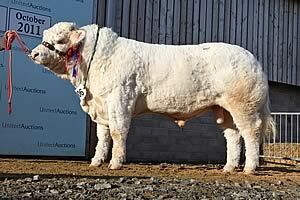 Funky who had headed his class, was knocked down sold to the Barker family’s Caylers Charolais, Nuthampstead, Royston. Michael Massie’s earlier investment was also recouped when his first class winner, Elrick Festival TI +38, SRI +36 made 8,500gns to Messrs Wilson, Whauphill, Newton Stewart. This 17 month old was by the 12,000gns Coolnaslee Adversary and out of a homebred dam going back to Blelack Nextnews. Goldies Banker and out of a homebred dam by the 28,000gns Farleycopse Turbo. Next at 8,200gns was Strathorn Freddie, an 18 month old by Whitecliffe David who goes back to Mowbraypark Paramount, and out of a homebred cow by Rumsden Samurai. Bred and exhibited by D and R Skinner, Inverurie, Freddie was knocked down sold to Messrs McGillivray, Ballindalloch. Balthayock Firepower TI +53, SRI +47, an 18 month old by the 26,000gns Balbithan Vespasian from David Walter and his son, Nick, Balthayock, Perth made 7,500gns to Messrs Watkins, Cold Brook, Abergavenny. A second 7,500gns call was made later in the day for the junior champion, Tonaghmore Favourite TI +32, SRI +30, a 15 month old by the 55,000gns Thrunton Voldemort and out of a homebred dam from Harold and Caroline Crawford’s 22 cow herd based at Fintona, County Tyronne. While the Crawfords and their 16 year old daughter, Kyra were making their debut in Stirling, Favourite was no stranger to the ring having secured the reserve breed title at the Balmoral and continuing in reserve place for the rest of the season. The bull was knocked sold in a two way bid to Kingcraigie Farms, Lumphahah, Banchory and near neighbours, Nether Balfour Farms. Minutes later, Coolnaslee Foreman, another 15 month old bull from across the water attracted a 7,500gns price tag, this time from Messrs Leiper and Sons, Ponteland, Newcastle. Bred and exhibited by Gilbert Crawford, Maghera, County Derry, the previous day Foreman had stood below Tonghmore Favourite in the final junior line up before going on to be placed overall reserve supreme champion. The first son of the 55,000gns Sportsmans Columbo to come under the hammer sold, he was out of a homebred dam going back to Derrygiff Mills from Mr Crawford’s 70 cow herd. Next at 7,200gns, Jan Boomaars, Woldingham offered his highest entry, Vexour Felix TI +39, SRI +39, an 18 month old Maerdy Tally son to Terry Coghill, Birsay, Orkney. Among the half dozen lots to reach 7,000gns was Glenericht Formidable TI +34, SRI +35, an 18 month old by the 30,000gns Moyness Vivacious and out of a Balnuith dam going back to Dingle Hofmeister. Bred and exhibited by WK and P Drysdale, Blairgowrie, this first class prize winner went home with Messrs Brown and Sons, Stenton, Dunbar. A bid of 7,000gns secured Allanfauld Fieldmarshall TI +47, SRI +46, an 18 month old Elgin Davinci son and out of a hombred dam going back to Harestone Tadorne. 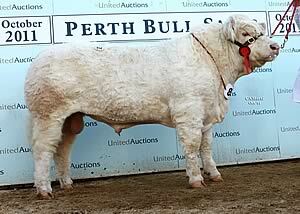 Bred by Archie Macgregor, Allanfauld, Kilsyth, Fieldmarshall went home with Messrs Henderson, Banton, Kilsyth. Graeme Leggat, New Pitsligo, Fraserburgh offered his Newhouse Bigal son, the 17 month old Bonnykelly Ferrari for 7,000gns to Messrs Wight and Sons, Carwood, Biggar. Another 7,000gns bid, this time from Messrs Lindsay, Kirriemuir, Angus secured Marwood Falcon TI +34, SRI +24, a 16 month old by the 10,000gns Coolnaslee Advocate from the Blyth family, Roy, Jean, Neil and Kirsty, of Elwick, Hartlepool. The female trade was led at 3,000gns three times. First in the ring was Caithness Dotty, an in calf heifer by Caithness Torpedo from D and M Campbell, Lybster to Messrs O’Kane who took home six more female entries to Lower Kildress, County Tyrone. Iain and Dot Goldie, Cummertrees, Annan invested 3,000gns twice in two more in calf heifers from the Caithness herd – Caithness Elenor and Caithness Erin, both by Fairway Aircontrol. Averages: 97 bulls £6,279; five females £1,722; Alsnow: 3 females £2,275; Caithness: 5 in calf heifers £2,919; Allanfauld: 6 cows and calves £2,345.